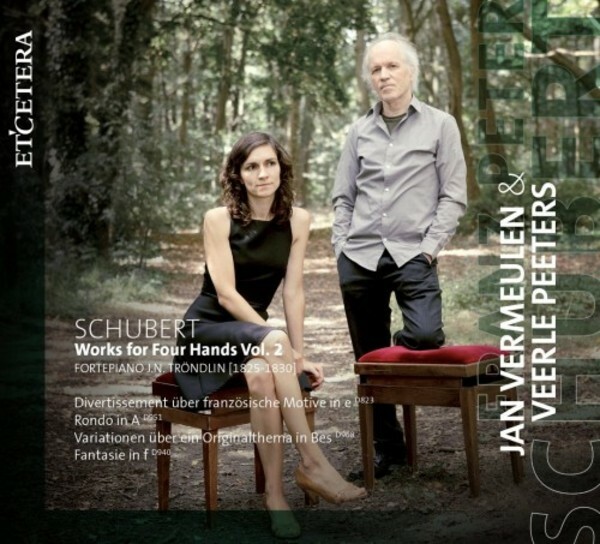 Jan Vermeulen’s series of twelve CDs of the complete works of Schubert for piano solo was greeted with praise by the Belgian and the international music press. He was named Musician of the Year in Flanders on the occasion of the completion of the cycle in 2010 and also carried off one of the coveted Klara awards; several international music magazines described him at the time as an ideal interpreter of Schubert’s music. It was only to be expected that a recording of Schubert’s works for piano duet would soon follow. The search for a suitable duet partner did not cause Vermeulen too many headaches: Veerle Peeters has known Jan Vermeulen for some fifteen years, first as a star pupil of his at the Lemmens Institute in Leuven, then as a partner for recitals of music for piano duet, and then as artistic director for all of his Schubert recordings up until the present day.